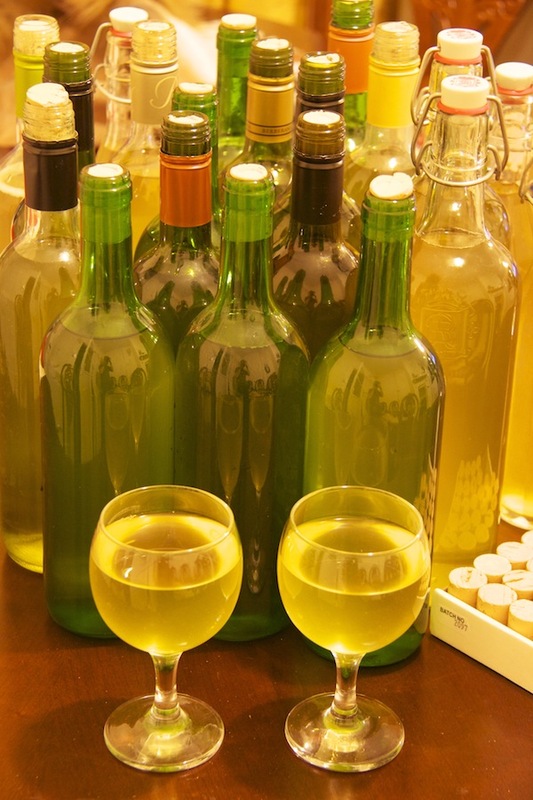 Mo’ Mead – MelonMel Melon Mead: Done! Well, it’s finally ready! My birthday melon mead is bottled and ready to be drank! It has a very pungent smell of melon, way more than I expected and a very subtle taste. Even though you can smell the melon, there is only an aftertaste of melon in the mead, which was quite interesting! This time, I made a lot, 20 bottles worth! If the help of a friend, we managed to clean everything, bottle two different meads (the other will come in a different post) and transfer the wild plum to secondary. It was quite an effort, but it paid off! Now just wait to mature so that it can be better enjoyed! 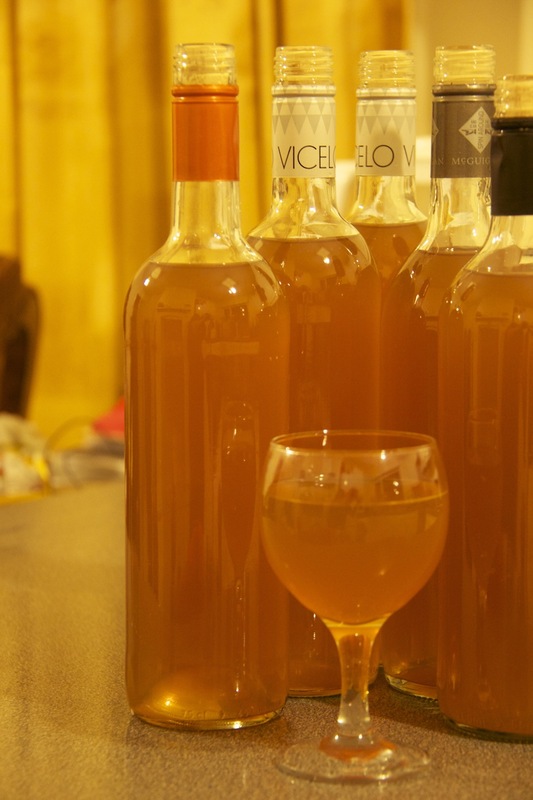 Local Shop Homebrew – Final Part: Carrot Wine! After three weeks in secondary fermentation and three days stabilizing, The wine was finally bottled! I had a taste and it was quite mild in taste, but so alcoholic! It was a very nice brew, very very cheap indeed! The total cost of the brew was about £5, so £1 per bottle, plus 500ml that were drank just moments ago! If you are tempted to have a go at homebrewing, this is a very hard to get wrong type of brew! Highly recommended and, really, I hope someone will try it! THis post contains 3 photos. Click to enlarge them. This is a bit of a risky kind of brew, but I will give it a go anyway. 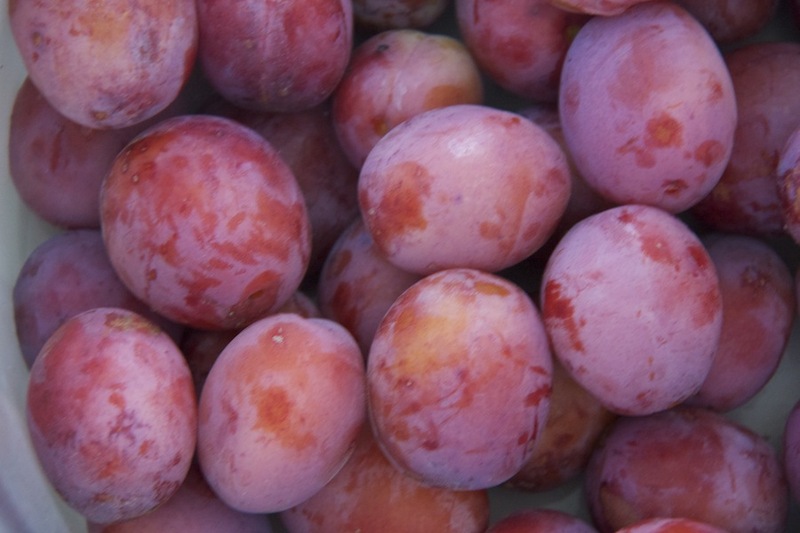 Some fruits come with a natural coat of wild yeast on their skin. This can be beneficial to your brew, but dangerous, because wild yeast can infect your brew. After a quick rinse, the plums are deseeded and quickly hand pulped. This would make homebrewers cringe, but I did sanitize my hands well! Well, back in the day, wine juice was extracted by stepping on grapes, so why not use my hands? Then soak them on a solution of water, honey, lime and lime zest, which was boiled for one hour. 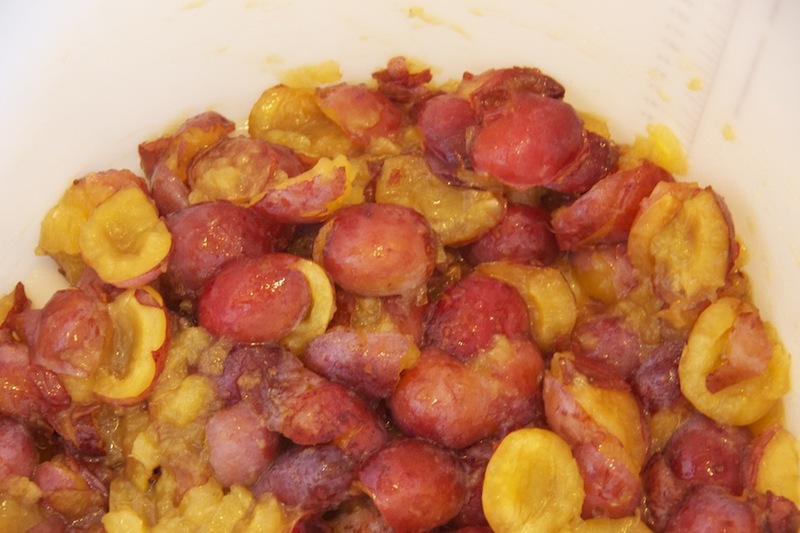 Dump the boiling water onto the plums and close the fermenting bin. That’s it. Give it a bit of a mix for the next two days and leave it. A bit of natural selection, after the boiling water in dumped, only the strongest yeast will survive! Who doesn’t like beer? And even more, who doesn’t like caffeine? Mix the two together and you should get an amazing beverage, right? Well, not so much. I will try to explain why. 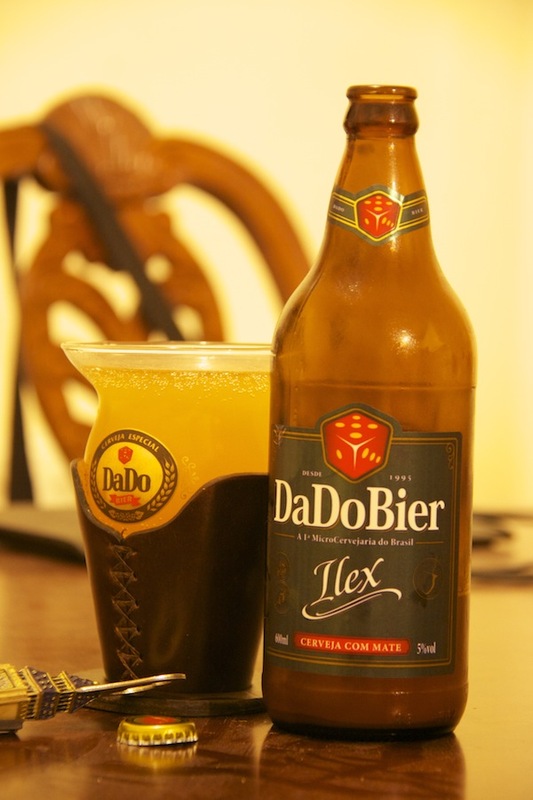 DadoBier is the first brazilian microbrewery. It’s located in the mid-latitude city of Porto Alegre, in the southern state of Rio Grande do Sul. The state prides itself for having the best wine in Brazil and, well, they have the climate for it! 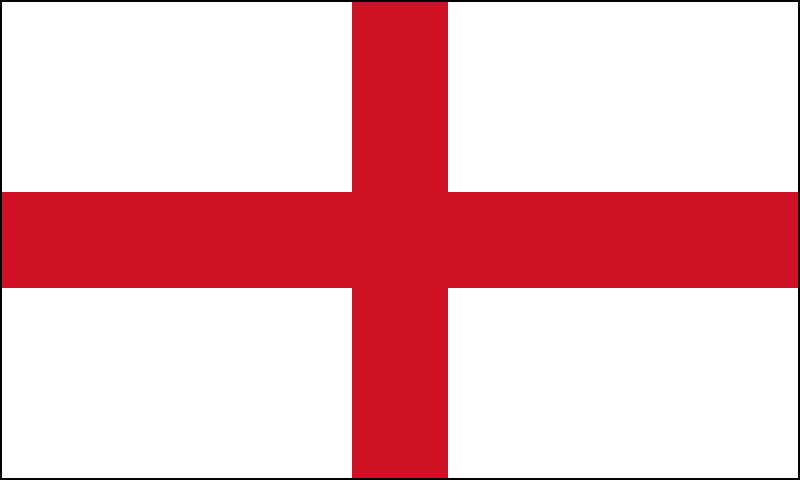 Also for making beer, since the southern region of the country is the largest producers of barley. The state is the second largest producer and the largest consumer of a commodity called Erva-Mate, or just Mate. It’s a herb which is mainly used for tea and has a high caffeine content. If you walk around the city of Porto Alegre, you will see hundreds of people drinking the stuff wherever they go. Think that the British are big tea drinkers? 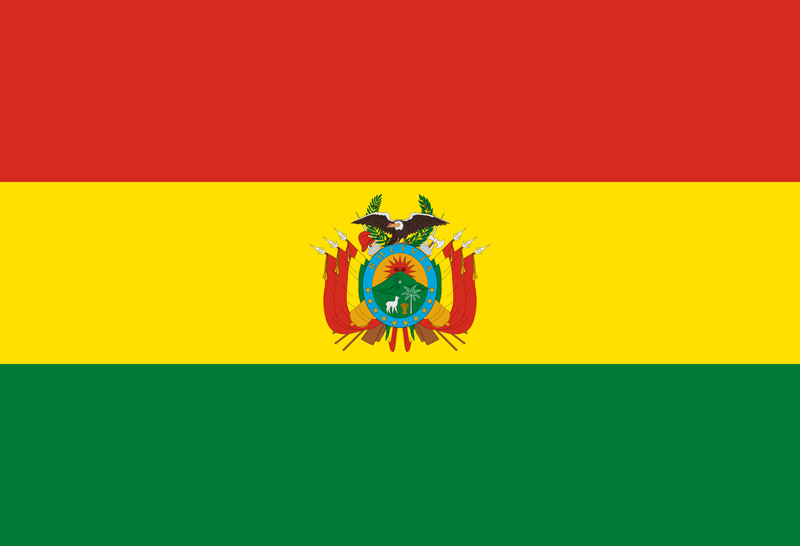 The Gauchos (natives from the state) would put them to shame. Brazil itself is not a big tea drinking country, but the Gauchos consume a whooping 10kg of Mate per capita per year, which puts them ahead of Turkey, the biggest tea drinking country in the world (at 7.32kg/pc/py). But I digress. So thinking that having the climate and ingredients for a good beer would give them an edge? Well, not so much. Adding a bit of their favourite drink to the beer? That didn’t work so well. Now add that beer to their custom made Cuia-shaped glass? Well, that’s the recipe to get flat and bland beer. In their novelty glass, I couldn’t pour the beer and take a photo fast enough for the head to hold shape. The beer is ok, but the flavour changes quite a bit very quickly, most likely due to oxidation due to the lack of the protecting head. I have brewed with tea before and I am not sure the techniques they used to add the mate to the brew, but I can say that they were unsuccessful. Now for the price. The average citizen of Rio Grande do Sul is better off than the average Brazilian. The beer is slightly expensive, at R$14 (£4) for a pint, it is still quite expensive for the local working man. But as it so happens to microbreweries in Brazil, producers manage to keep the clientele very selected. You can find Dadobier online, if you so choose, but most places are out of stock and, in Porto Alegre, one of the few places where you can find the beer is at their restaurant. This leads to you buying overpriced food with it. 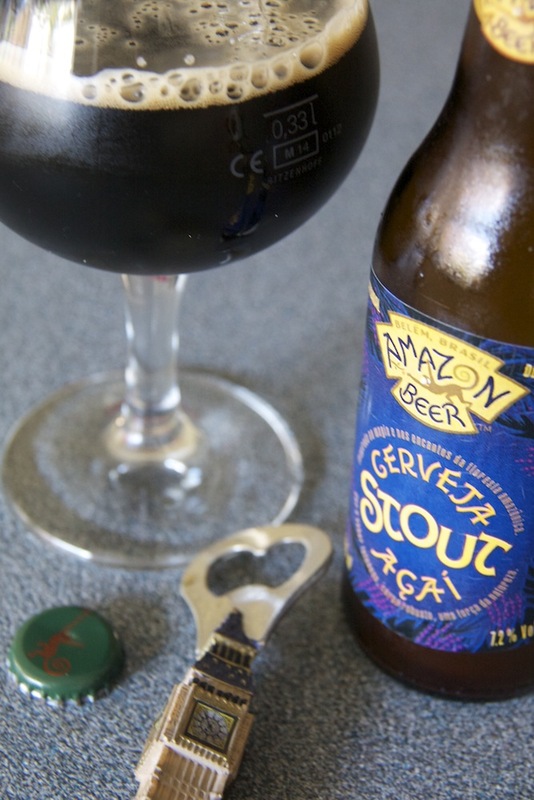 So, again, just like with Amazon Beer, if you are not part of the elite or pseudo-rich, this beer can be seen as something you can treat yourself to in a special occasion. Knowing how much it takes to produce beer and having most of the ingredients locally available, overpricing beer that isn’t all that good seems to be the thing to do nowadays. Microbrewers in Brazil are having a field day with the new middle class! 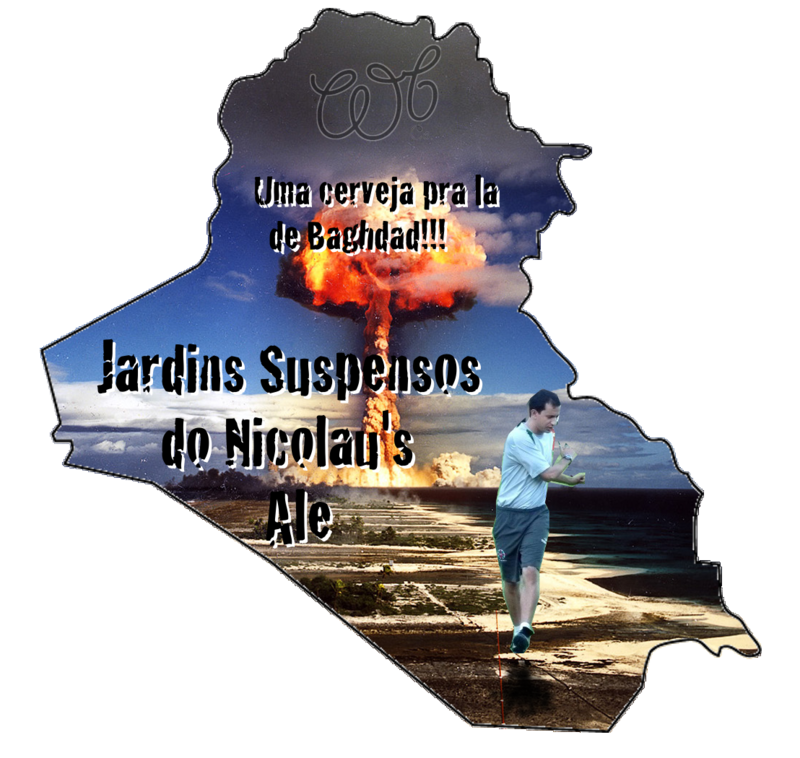 It’s one of my best friend’s birthday today, so a while ago I decided to brew him an Ale. It’s not ready yet, by the way, but the label surely is! Why the name?? He lives in Iraq and works for a local football team (soccer of you americans). Just trying to be a bit humorous about the daily worry we all go through! This post contains 5 photos. 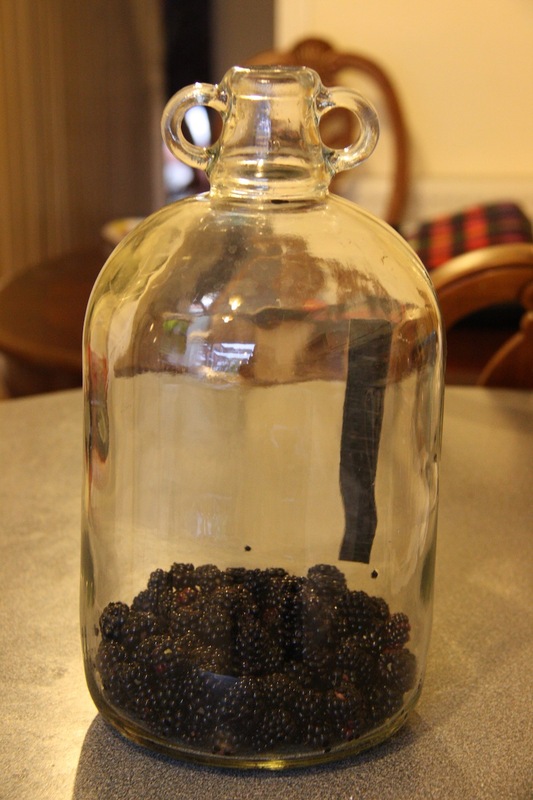 In the earlier post about fruit picking, the purpose of my picked fruits is the usual: homebrew. Blackberry are bloody expensive and farmed ones are not as delicious! 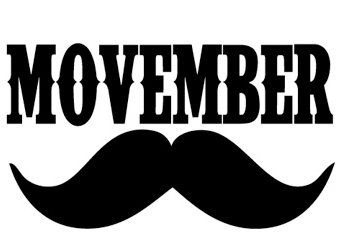 Anyway, In a few months, I will have, hopefully, a very delicious drink! I favour brewing mead over other drinks because, well, I prefer to other drinks and it’s the one that is most difficult to mess up. Why? Honey, that’s why! 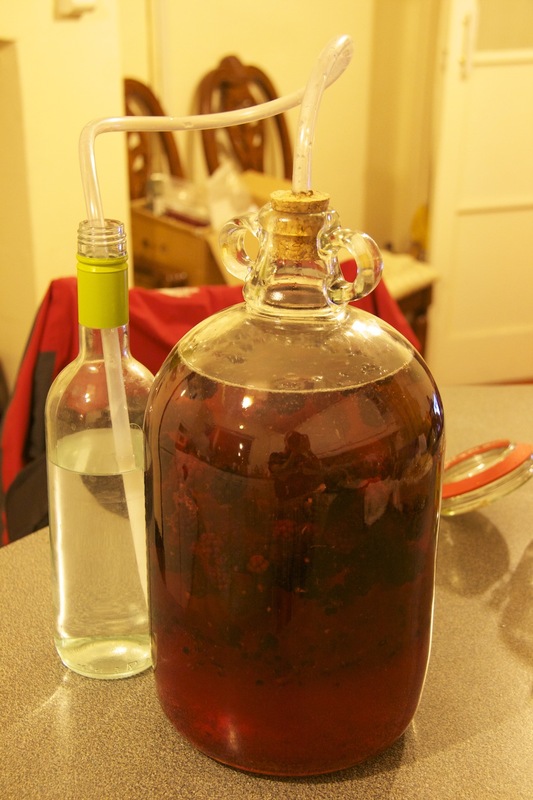 Place the berries in the demijohn (the glass fermenting thingy). There might still be some bacteria/wild yeast/general oganisms that need to be killed. Want to sterilize fruit? Want to sterilize anything? Cover it in honey! 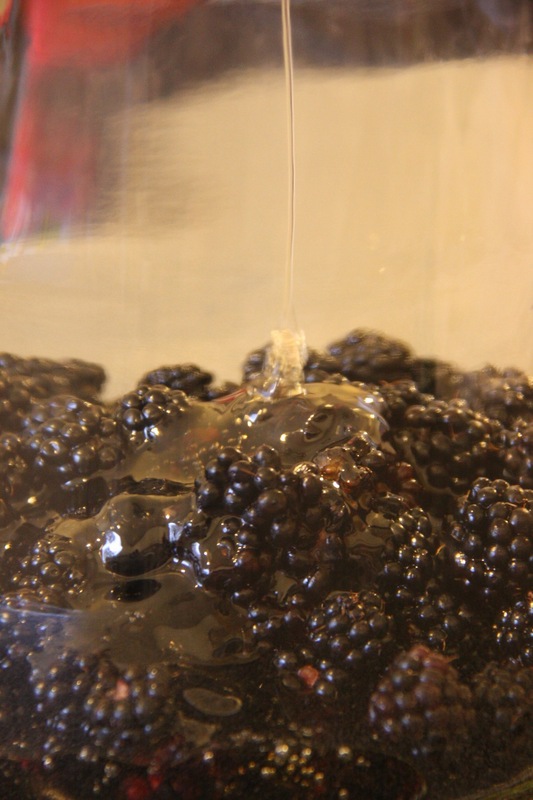 Add half of the honey into the demijohn and leave the fruits soaking in it. Honey is anti-everything… it will kill wild yeast and other fungi, bacteria, any tiny organism in and around the berries + all the health benefits. If the amount of honey added is kept high, the likelihood of infections in your brew decrease quite a lot. That’s why it’s hard to get mead wrong. Sanitation and infections are a big problem in wine and beer, but mead has the power of honey to back it up! Pretty cool, right? After a good honey soaking for about 30 minutes, add 1.5L of boiling water to the demijohn and let it sit for another few minutes. Close it with the airlock/blow tube. Even though mead is harder to infect, don’t take chances! Further sterilization will occur, but this step is most important to dissolve the honey, mostly. In a sauce pan, heat the water add the honey, lemon juice and zest. Mix until the honey has been dissolved. 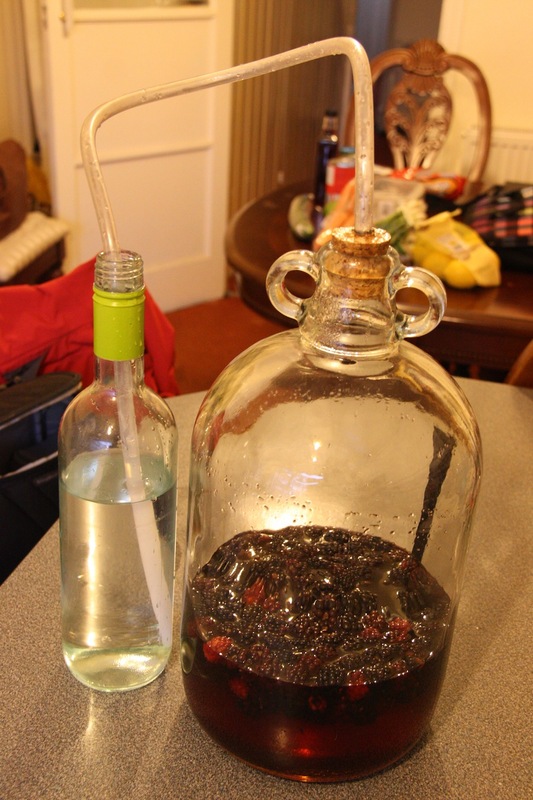 Add it to the demijohn and close it again. Only pitch the yeast when the most is below 25C. Let it ferment for a minimum of 10 days (fermentation is about to stop usually when the airlock is producing only one bubble every 4 minutes). 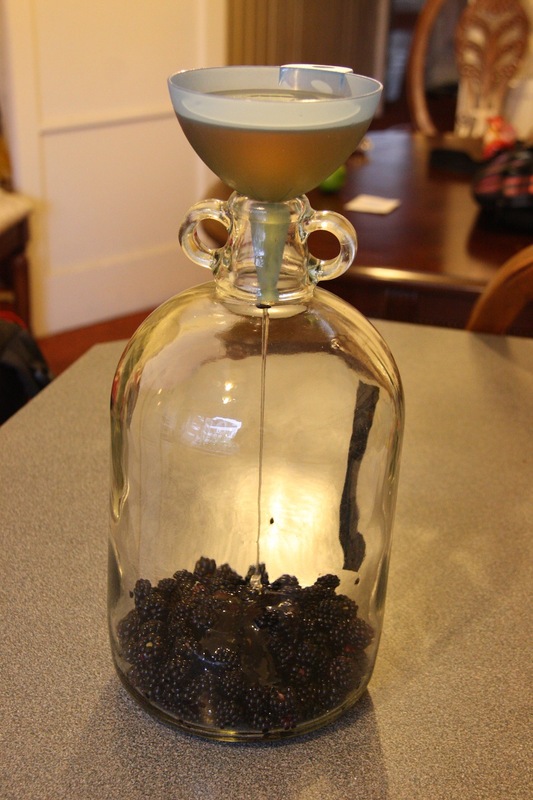 Move to secondary fermentation, add the other half of the berries still frozen and let it ferment for another 3 weeks. Then move to tertiary fermentation for another 3 weeks. The mead should be clear and ready for bottling at this stage. It takes a long time to make it, but trust me, it’s worth it!